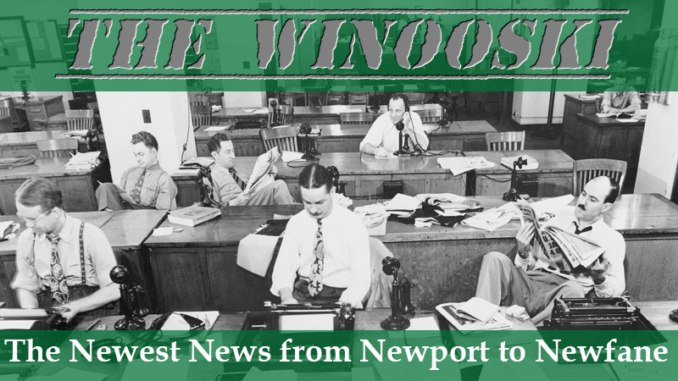 WINOOSKI – For almost two years Vermonters have enjoyed the biting satire and silly humor of their premiere local satire site The Winooski, but starting today that site will no longer be producing satirical takes on the news of the state, but will be covering the news in a more traditional manner. Following the example of state-wide online news organization VTDigger, with whom they have partnered for several months, The Winooski hopes to be able to bring in-depth reporting to Vermonters on hard-hitting stories that other news outlets aren’t covering. “Satire is fun and all,” said founder and Editor-in-Chief Adam Hall, “but eventually you just want to do something real, you know?” While Hall has said that he does think the exaggerated and sometimes pointed articles have had some usefulness over the years, he hopes to be taken seriously as a legitimate news organization, despite having no budget and no staff. It is unclear how the site will fare in the online sea of news organizations, but for now readers will have to get their satire somewhere else. The state does have several other non-premiere satire organizations working hard to churn out insightful humor on a regular basis. The Winooski will leave all of its old articles online for the rest of the day, but the whole site will be scrubbed and rebranded starting tomorrow. Hall says the first actual news pieces, including video reporting, will be on the site’s Facebook page before the day is up. I dunno. VTDigger has stories that are real news but read like satire. A lot of your stories that are supposed to be satire sound like real news, the kind that respected news organizations work hard to research and investigate. I recognize that this piece was released on April 1st, but so were some verifiable news stories that are so bizarre they were mistaken at first glance as satire (or even, heaven help us,irony). How are we the readers supposed to sort all of that out? We are already confused. We are still trying to sort it all out ourselves.